I may have already mentioned that my son has acquired a considerable recipe book collection. The past couple of years he has asked for cookbooks for Christmas. I actually had to give him some space on my cookbook shelves! About a year ago he picked up a wonderful book called “Step-by-step Italian” (Parragon Books Ltd, 2011) with easy to follow recipes including step-by-step photographs of classic Italian dishes. An excellent choice for any novice cook. Then again, it can also be quite helpful even for an experienced cook! 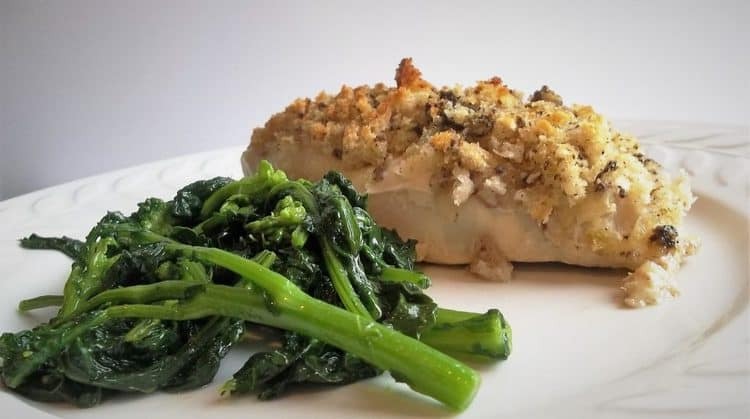 One of his recent selections was this chicken stuffed with pesto and crumb topping which he prepared for us for the first time a few weeks ago. Unfortunately, that night we noticed that we were down to our second to last container of frozen home-made pesto (sniff!). We decided to improvise a bit by mixing basil pesto with store bought black olive pesto. Not a bad combination! Of course, you can also stick to only basil pesto, if you prefer. Since we are fans of extra cheese we decided to add some grated parmesan in the filling. It was a successful meal and my daughter recently requested it again, so you know it had to be good! The original recipe calls for fresh ciabatta bread crumbs and I recently used breadcrumbs made from my mom’s homemade bread, but any country style bread will do. It’s an easy recipe, doesn’t take long to prepare and bakes in only 20 minutes. Perfect for rushed weeknight dinners! Preheat the oven to 425°F. Cut a deep slash into each chicken breast to make a pocket. Combine the basil pesto and olive pesto. Spread 1 tablespoon of pesto and 1 teaspoon of parmesan cheese in each pocket. Fold the chicken flesh back over the filling and place in an oiled baking dish. 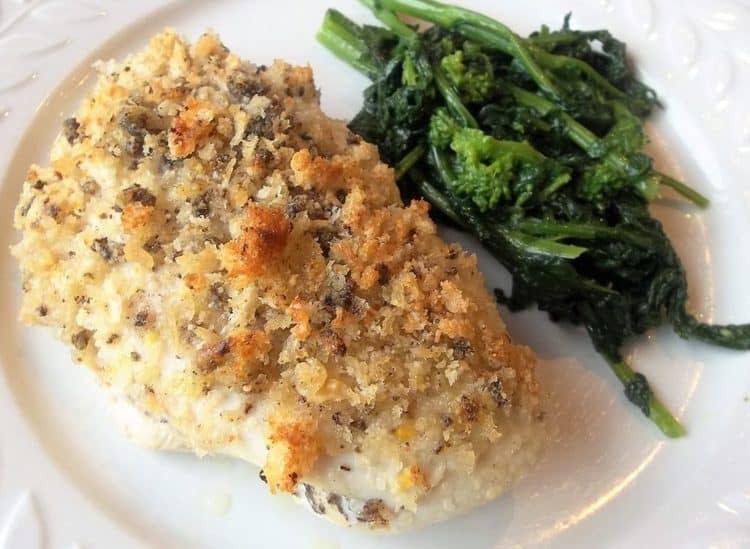 Mix the remaining pesto with the breadcrumbs, 1/4 cup of parmesan and lemon rind. 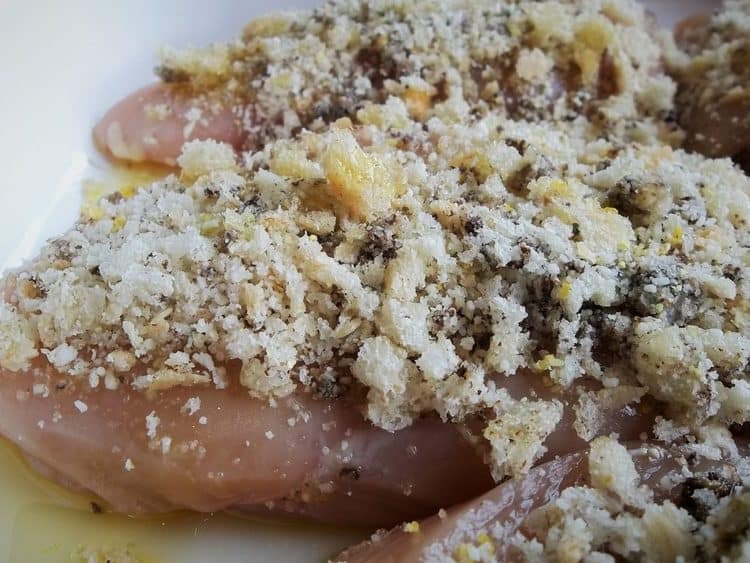 Spread the breadcrumb mixture over the chicken breasts. Season with salt and pepper to taste and drizzle with olive oil. Bake for about 20 minutes or until the juices run clear when a skewer is inserted into the thickest part of the meat. Love your mouth watering dishes. Keep it up, it`s fantastic! Looks delicious! Lucky you, having Joshua cook for you!